Vada Chennai definitely has some pacing problems. But director Vetrimaaran’s deliriously intense staging techniques very often keep us on the edge. Tamil film-maker Vetrimaaran is interested in portraying the downtrodden, their social milieu and its challenges. While his depictions are suffused with authenticity, Vetrimaaran doesn’t entirely distance himself from few of the commercial diktats. Visaranai (2016) was largely devoid of the compromises, compared to the director’s earlier works: Polladhavan (2007) and Aadukalam (2011), films that tried to balance the star and actor within Dhanush. While Vetrimaaran’s story-lines aren’t original, his remarkable ability to weave conflicts and bring forth grey shades in characters has repeatedly provided us with hard-hitting movie experience. With Vada Chennai (‘North Chennai’, 2018), the director once again ably marries raw realism with discernible masala moments. Anticipating the criticism persistently heaped upon Tamil cinema’s treatment of North Chennai (as a safe haven for dons), the film begins with a sort of disclaimer that this isn’t a well-rounded portrayal of North Chennaites. Then the film opens with a brilliant, high-pressure moment: a sickle soaked in the blood falls on a table littered with cigarette butts and alcohol. The four perpetrators sit around in a relaxed manner and sort out the details. Soon, like the sickle casually thrown upon the table their lives get tossed, new enmities are developed, as the cycle of violence, greed, and repression continues. The story’s protagonist Anbu (the wonderfully restrained Dhanush) isn’t present in the opening scene and he is said to be just a teenager by this time (1987, the year Tamil Nadu’s Chief Minister MG Ramachandran passed away which seems to have an indirect influence on the bloody events). But Anbu’s fate is intertwined with this blood-soaked moment (as narrated by Vetrimaaran in a brooding voice-over). The narrative in first-half keeps jumping between two timelines with one dealing with incarcerated Anbu’s struggles in the prison and the other capturing Anbu’s accidental encounter with the criminal underworld while being a talented Carom player. Vetrimaaran’s penchant for exquisite detailing or world-building is pretty evident in the early prison-set sequences. Anbu fearfully navigates through this enclosed, begrimed world, hoping to find a safe side in the prison-mafia wars between Guna’s (Samuthirakani) clan and Senthil’s (Kishore) group. Vada Chennai takes time to establish the gangs’ vast network of threads, their umbilical link to politics, and gradually moves on to a different layer to render Anbu’s significance in this invincible cycle of bloodshed. Vada Chennai definitely has some pacing problems. It seemed too relaxed in the jail portions and too-rushed in the second half of the narrative, especially when Anbu makes a sudden transformation to swaggering, brow-beating hero. But Vetrimaaran’s deliriously intense staging techniques very often keep us on the edge. The ‘restaurant murder’ scene was one of the brilliantly staged sequences in Tamil cinema, enlaced with a bit of dark humour, and a lot of tragedy and chaos. Vada Chennai is closer in tone to Sasi Kumar’s Subramaniapuram (2008) than Selvaraghavan’s Pudhupettai (two of Tamil cinema’s best gang-related drama). The pivotal action sequences unfold in a very natural manner, immersing us in the atmosphere fraught with danger. Cinematographer Velraj has done a tremendous job with black and grey colour palettes to bring out the grimness and uncertainty in the tense scenario. I particularly relished the fight scene inside a fallen shamiyana tent in the prison-grounds with bold alternations between light and dark. 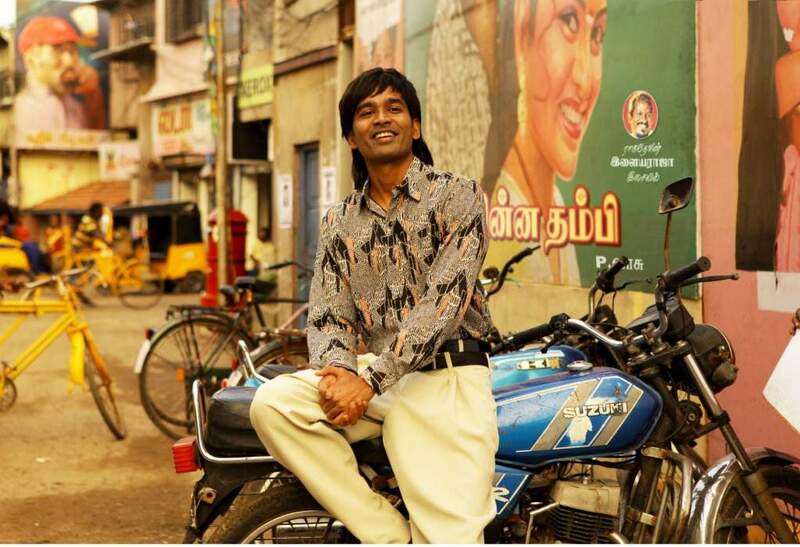 Vada Chennai does have a relatively upstanding gang leader character (played by Ameer) and as often seen in cinema, he talks of people’s welfare, individualism, and honour. However, Vetrimaaran neither glorifies the life of crime nor downplays the covetousness of these gangsters, for whom teeming up with men of higher authority seems to be the ultimate goal. One fascinating aspect of the writing is the way the ripple effects of political and social changes are shown to wreak havoc on the voiceless communities. The 1986 Pope’s visit to then Madras, MGR’s death, economic liberalization of early 1990s, and Rajiv Gandhi’s assassination are made a passing reference in the narrative, although these alleged news items seems to twist and transform the lives in the lower rung of socioeconomic ladder (this almost carries carom board analogy). Also, Read – The Reincarnation of Indian Cinema. Even the entry point to the fishing hamlets is repeatedly shown to be a hole in the wall, the wall that masks the view of battered huts from the bustling roads. Moreover, by touching upon the politics of gentrification and ghetto ‘rehabilitation’, Vetrimaaran has tried to take the familiar gangster saga to newer dimensions. In fact, the overall success of this story would rely on how deeply these political overtones are developed in the upcoming parts. Vada Chennai (166 minutes) offers gritty, engrossing gangland conflict that audiences can’t refuse. Barring few slackening narrative elements and pacing problems, Vetrimaaran has delivered a good beginning to the much-anticipated trilogy.